Colorful jewelry designed to coordinate with your fashions, it is designed in France, though made in Asia. Featuring beads mounted securely to a thin backing that looks and feels like leather but is not, the jewelry has strength, flexibility and light weight to be comfortably worn on wrists, necks and ears. And though handmade, the component cost is less, so this is economical style. Some color combinations are youthful, some more sophisticated, pick your pleasure! Wondrous abstract motif in bracelet with irregular edges and patterns within, formed from beads in turquoise, light blue, periwinkle and lime colors, secured to sky blue fabric backing. Up to 1-3/4 inch wide, the ends have silver beaded ribbon attached to foldover metal clasp. Goes around wrist smoothly, 7-1/4 inches long, can be worn snug. 2-3/8 inch pendant in flower motif has colorful beads and silver metal bead ribbon secured to flexible sky blue backing. The colors include turquoise and lime green. Suspended from skinny silver metal bead ribbon with tongue-in-slot clasp, 16 inches long. 1/4 inch wide, about 6-3/4 inches long, skinny bracelet has beads secured to sky blue backing, silver beaded ribbon on the ends attaches to foldover clasp. Designed to circle the wrist smoothly, may be worn snug. EACH skinny bracelet will have a different motif in colors of turqoise, periwinkle blue, lime green. Cannot specify exact design or color combo, if you order several each one will be different! Colorful beads are secured to flexible sky blue fabric backing, formed into elegant flat pod shape and suspended from short silverplated earwire that has a sleek contemporary shape befitting the earring style. About 2-1/2 inches long overall, 3/4 inch across, the colors are turquoise and lime green. Colorful beads are securely mounted to comfortable and flexible sky blue fabric backing, the pattern is created with colors of turquoise blue and green, with silver beaded ribbon at ends. Bracelet measures about 1-5/8 inches wide, 7-3/8 inches long when closed by foldover style clasp. It can be worn snugly. About 1 inch across, silver metal beaded ribbon edge contains the colorful beads and silver stud at center. 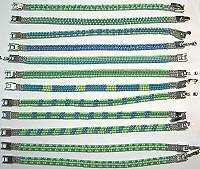 The colors include turquoise and lime green, secured to sky blue backing. CLIP ON style for all ears. Wondrous abstract motif in bracelet with irregular edges and patterns within, formed from beads in turquoise and orchid colors, secured to silver fabric backing. Up to 1-3/4 inch wide, the ends have silver beaded ribbon attached to foldover metal clasp. Goes around wrist smoothly, 7 inches long, can be worn snug. Colorful beads are securely mounted to comfortable and flexible silver fabric backing, the pattern is created with colors of turquoise and orchid purple, teal crystal at center and another green one at top. Pendant is 2 inches long, suspended from silver beaded ribbon. Tongue-in-slot clasp, about 17-1/2 inches long. Colorful beads are secured to flexible silver fabric backing, formed into elegant flat leaf shape and suspended from elongated silverplated earwire that has a sleek contemporary shape befitting the earring style. About 2-5/8 inches long overall, 3/4 inch across, the colors are turquoise and orchid purple. Read about what others think of Femmes Fragiles jewelry! Instead of reviews for a specific product, this is a place to share about the designer line in general.